Quality isn’t just a word. Throwing off the constraints of traditional car rental in Namibia, Safari Car Rental offers you the latest new, models 2017-2019, premium 4×4 vehicles for your adventurous African self-drive safari together with an innovative new pricing system that passes available discounts directly on to you at the very moment you book, not after you have finished your rental with a promise for the next. Watch our Vehicles & Prices; the earlier you book, the lower the price! 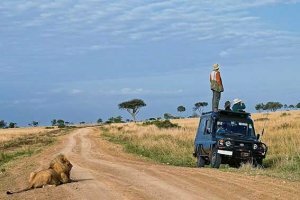 Our Limitless Price Drop Security, available only with Safari Car Rental, is a year round program that allows you to take advantage of discounts and price drops even after you have booked. If the rental price of your booked vehicle drops after you have booked you will automatically receive a new quote with the lowest price available. You won’t have to feel anxious about whether or not you have booked at the right time to get the best deal. You will always get the lowest price available for your rental! We don’t configure new camping equipped off-road vehicles as we like them but as you like them. When we bring our unique 4x4s on the market we do not ask ourselves “How much can we rent them out for?” but “How little can we rent them out for?”. We don’t tell you what the best service is; we ask you how we can be best of service to you. 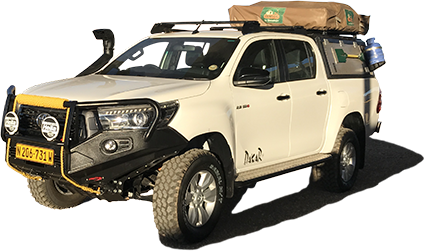 In August 2018 Safari Car Rental clients took the first brand new Toyota Dakar 4×4 2.8 GD6 on the road. The Dakar was upgraded to Safari Car Rental’s famous Expedition model, the first of its kind in Namibia. Safari Car Rental is the fastest growing car rental in Namibia for the fourth year in a row because we have the best prices on 4×4 vehicles that are technically upgraded and equipped to the highest standards. Our 4x4s allow you to effortlessly negotiate our beautiful but often remote and harsh African roads. Our rental vehicles also include lots of free extras like a Garmin Navigation System equipped with Garmin and Track4Africa maps, a 24V Air Compressor, and Extra Large Roof Tents. You’ll find that our 4x4s are the safest, most comfortable, and certainly most fun to drive. We want you to experience the uniqueness of our Namibian wilderness, our African wildlife and your off-road adventure totally carefree and turn it into an unforgettable once-in-a-lifetime experience. You can count on us to help you make this come true!